Unfortunately, I've only seen one 9312 come up on eBay. And it went for WAY more than the price that pajaro was quoting. Thanks for letting me know. That is a shame. The 9312 was next in line for my wish list. I hope that I can run across one at a flea market, or maybe an estate sale then. If I can get that one, I might call it good for my nib wish list. Later I will probably get a J, but I want it to be in excellent condition. Many that you do come across look beat up, and frankly those don't interest me at all. If they are in great shape, the prices often are what I consider expensive. I don't care about the sac. I have a friend who can put a sac on for me. I am in no rush though. He did find me another old pen, but it isn't an Esterbrook. It is going to need some work. My track record in acquiring old pens hasn't been good. The Esterbrook is running perfectly with no leaks. I hope it stays that way, as I am very satisfied with the LJ, and I love using it. The XX12 nibs are not common. One can glean that. Several years ago I paid $37 for a 9312 and around $30 for a 2312. The other 2312 I have came in a pen, at ordinary kind of price of around $20. These are interesting collector's items. I have used them and they are nice italics. I don't see them in the current market. The idea of offering the seller an amount via message is what Bruce from Ocala, Florida, had suggested to do. If you really want something, it is worth trying. .
Pajaro, I don't know if you were speaking to me or Ruth. That is good advice though, thanks. I am going to have to let some time go by, before I consider anything else right now. Because I learned how to make simple repairs to Esties, I have over 50 of them. I like the look and the feel of the dollar pens. I have the six colors in dollar, ribbed transitional, transitional, J, LJ, SJ, sj transitional (aka Demi transitional). I am missing one pen from that collection: the black Demi transitional. Let me know if you know where there is one for sale. I've been looking for four years. I bought a couple of SJs in red and black that turned out to be transitionals. I like the cut-off ends of these pens. I haven't found many black J-series pens. I am sure some are out there. Probably they are gathering dust in places nobody would think to contain pens of any value. I gave the black SJ transitional away. "I gave the black SJ transitional away"
Is there an emoticon with a knife through a heart? I've not encountered the x312 nibs. The original 312 dip nibs are fine/medium stub nibs. Are the x312's the same? Are they straight across, as opposed to the x314 Relief nibs? How sharp are the corners? The original 312's are pretty rounded at the corners, meant for rapid writing. 239 Chancellor's stub: small stub, easy to write with, durable. This is really tied with the 314 Relief. Some days I like one more than the other, but it depends on mood, relative humidity, sun spot activity or phases of the moon. I can't figure it out. Edited by AAAndrew, 20 July 2018 - 14:03. The 9312s (and I think also the 2312s) are listed as being "Italic" nibs. So I'm presuming that they're just that -- especially since the 2314/9314 nibs are specifically listed as being "Relief" nibs (I have some of those nibs and they're obliques). I don't know how sharp the edges of a 9312 nib are -- I have only actually seen *one*, and didn't get a chance to try it (just drool). But the owner of the pen was kinda astounded that I actually knew what an Esterbrook pen WAS (she also had some unidentified black Pelikan for which she'd had Richard Binder do a regrind on the nib at some point). I don't know enough about the dip pen nibs to be able to say one way or another. I do -- somewhere in the house -- have a dip pen set (two holders and about ten nibs, still on the original display card) which I spotted in the window of a shop about a half block from Bromfield Pen Shop a few Christmases ago. I'm not sure why I was even looking (the place seemed to specialize in coins and sports memorabilia) but it caught my eye -- and was only ten bucks, IIRC. But I seem to recall that it doesn't have any really exotic nibs (such as a cartography nib). The the two 2312 and one 9312 I have are like cursive italics. The edges are not sharp. The edges might have become worn from use, however, so I think you have to consider that. The nibs are about 1 mm or 1.1 mm line width. I really like them. They and a few other odd nibs make Esterbrook worth using. Once the italics became popular lots of others popped up to meet the need at reasonable cost, so the main value of the 2312 and 9312 might be historical in that they let you use an italic in a low cost pen of interest to collectors. Under the loaner program I believe I offered these for loan, and there were no takers. Ironically, the loaner program was the reason I kept the Esterbrooks. Too expensive to ship them now. SJ- red, 9450 - due to it's diminutive size I don't use it much. Probably the least of all my Estie's. 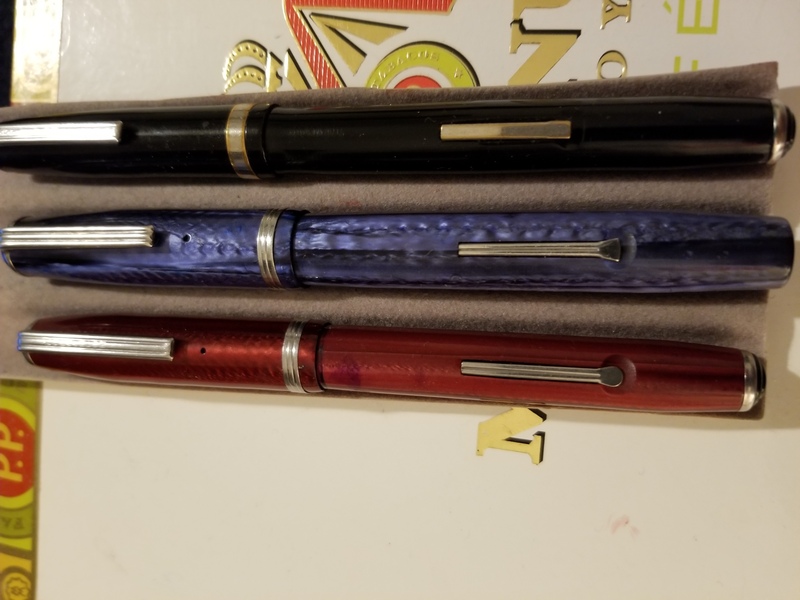 No desire to trade/sell though as it completed my collection of one (or more) of each of the SJ, LJ, J pens. LJ - black - Bell Systems pen, 2464 (manifold Broad) - got as a PIF from fellow member EoC. Due to the nib, it has been among my favorites. Green-9550. It was the first Estie I bought - from a fellow member in the Classifieds. Other than the LJ, all the rest were ebay finds. The black has a 9550 as well. The body is nice and shiny and it had been re-sacced and a new nib installed. Gray has a Venus Fine (currently), I forget what it came with. It came with a 9461, but I could never get ink to flow. Still have the nib though. The copper - a 1551 - it came with a 2556 - but it fell apart, so I just replaced it with a new 1551. The copper came with a broken clip. J-transitional - blue - 1555 Gregg, paid $5 more than I did for the copper. but have run the 2464 in it at least once. It might be the prettiest of all my Estie's. Like Ruth, all mine except for the black ones are the mackerel or standard - non icicle colors. I don't find them attractive enough for the price differential they seem to command. When I got it I was thinking I was getting a blue regular J. Mine does not have the ribbed cap jewel. So it is a bit later model I believe. From reading on Brian Anderson's Esterbrook.net site. All of mine have the same lever except for the SJ and the LJ. The LJ is a square end. Like completely square. The SJ is very round. The others all in between-like a spade- light curve on the end. Of course, the LJ has all kinds of "quirkiness". Different cap band than all the others, the lever, BELL SYSTEM PROPERTY longitudinally along the barrel, "Esterbrook" the other direction (around). The sac needs to be replaced I think. I may someday get a red and blue regular J and be done. Unless I decide to get a variety of 9xxx nibs. Right now all I have are EF;s. A 9450 and two 9550's. Unless I can get the 9461 working. In the photo you can see the three different levers I have on the LJ (right/top), blue transitional (center) and SJ (left/bottom). My understanding on this transitional - same jewel as the regular J/SJ/LJ line is later production so probably late 40's. Edited by Runnin_Ute, 30 July 2018 - 03:57. M2 is my favorite Estie model, and the 9128 my favorite nib - its just a great combination for my attempts at a Spencerian-Business cursive writing hand. Also, I echo the comments about the 9312 and 2312 nibs. I have both, well er had both. I recently traded away my 9312 nib to a friend, but its a great nib for writing cursive italic - pretty smooth for the nice line variation it affords. The 2312 is still NOS and I am saving it for I ever get back into cursive italic. Also, I just wanted to point out, because I don't think anyone ever before has commented on it at FPN, that the 9460 nibs have really decent stub-like line variation, some more than others. Over the years, I've become a huge Esterbrook fan. These pens are great performers, durable, so affordable and the variety of nibs is a huge plus as well. I like the M2 as well, and I have several, including two NOS. The Safari pump filler, which works like a Sheaffer Touchdown filler, is another. The 9460 is an interesting nib with an interesting line. It's great to see some activity in this forum. Runnin-ute, what's the black pen? It looks like a very late model J, when the quality started going down. It could even be a UK-made J pen.